THE countries best Under 17 and Under 18 players took part in the NAB AFL Academy’s 20th anniversary match at the MCG on Sunday. In appalling conditions, Team Daniher won by 46-points. 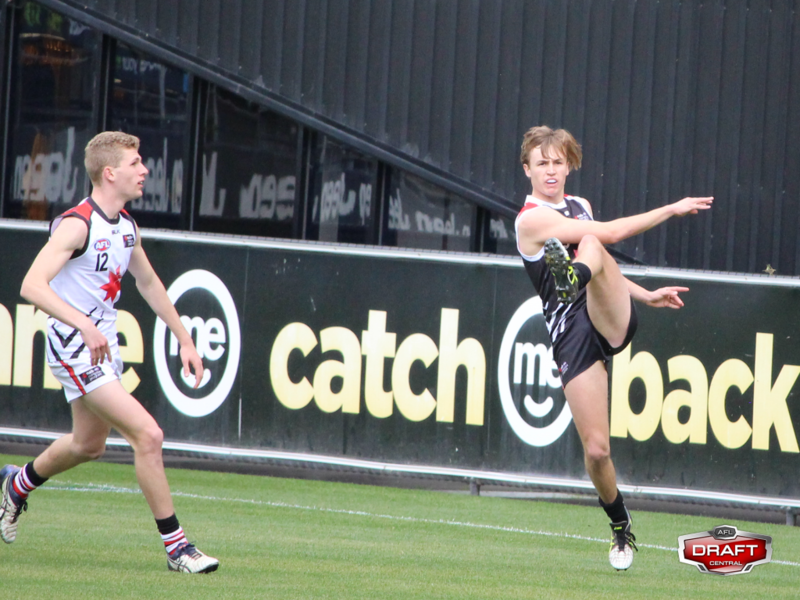 #1 Charlie Spargo – Finished with 19 disposals and five clearances in a good game in the midfield. Hit up Ballenden with a superb kick inside 50 late in the final quarter and was one of the more consistent players in the 4×20 minute quarters. #6 Rhylee West* – One of the better bottom agers for Weitering, the son of Bulldogs great Scott played predominately off half forward. West finished with 14 disposals, laid some good tackles and kicked the last goal of the game. #7 Jack Powell – Player who I thought was the most deserving of the best player for Team Weitering. Worked hard all day up and down the ground, winning the ball at both ends kicking it well. Set up Fogarty with a great kick inside 50. GWS Academy member and one to watch for the Allies. #11 Lochie O’Brien – The left footer did some good work in close using his quick handballs skills and kicked it well finishing with 19 disposals and a goal. Spent times resting forward rather than on the bench. #19 Darcy Fogarty – Kicked the opening goal of the game, before moving into defence in the second half. Wouldn’t surprise me to see him play more football there this season. Appeared to kick the ball more off his left foot than his right showing his willingness to go either way. Took on two opposition forwards deep inside 50 and was able to get around them, and also clunked a nice intercept mark. #21 Jarrod Brander – Floated between both forward and back after starting in defence. Uses the ball well off his right foot and just reads the play exceptionally well. Was cleaned up by Hunter Clark in the second quarter, but came back on and kicked a goal in the third quarter. #22 Oscar Clavarino – Defended well one-on-one, but his kicking continues to work a work-in-progress. Had one bad turn over coming out of defensive 50, but as a lock down defender he is rarely beaten. #25 Kwabye Boakye – One that caught my eye for the first time. Played in defence and started the game on Nathan Richards. Kicks it well on his left foot and has an outstanding step and is able to change direction quickly. He embarrassed a Team Daniher player at his ability to get around him. Did prefer to play behind his opponent and leap from behind and spoil the ball. #32 Connor Ballenden – Someone made the comment around me “That number 32 can’t be 18.” His presence and size makes him one of the more intimidating forwards in the 2017 draft pool. Very strong and whilst today he didn’t hit the scoreboard, he took a few good marks and followed up the ball well. #2 Cameron Rayner – By far the best player on the ground with 23 disposals and three goals. His smarts inside 50 and his power at the contest were outstanding. Whilst a natural right footer, made some really good kicks on his left foot. Whilst his endurance is a work in progress, but he worked hard both ways. #4 Jack Higgins – Will be kicking himself he hit the post twice within a minute – but overall again good signs from Higgins. He wins the ball at the contest and his damaging work as a goalsneak adds another dimension to the 178cm midfielder. Is a good mark overhead, so can be a target inside 50. #5 Sam Walsh* – Impressed from the first bounce, winning the ball on the MCC Members wing. Right foot kick found targets ahead of him and ran well. #6 Patrick Naish – 17 disposals for the Richmond father-son prospect. Continues to play good football. A smart footballer and a solid ball user off his right boot. Played more across half back than he has so far this season. #8 Kane Farrell – A quiet game until the final quarter where he had two simply outstanding kicks off his left foot which went inside 50 hitting Stephenson and Rayner straight on their chest. #13 Joel Garner – A quiet game with Garner playing all around the ground. At times probably needed to follow up his kicks a bit more, but I like him best on the wing. #15 Jaidyn Stephenson – Played further up the ground than he has so far this season for the Eastern Ranges. Bagged three goals, playing a role on the wing and across half-forward. Has plenty of tricks and is a superb mark when you give him space to jump at the ball. #24 Jack Lukosius* – One of my early favourites for next year’s draft. Simply did some things in the first quarter which would’ve caught clubs eyes. An impressive kick hit up Crossley in the goal square in the first quarter, before kicking the next goal some minutes later. Moves well for a player of his size and has the ability to play anywhere. Played forward in the 1st half, before moving back in the 2nd half. #32 Brayden Crossley – First time I’ve seen him since last season and looks like he’s put on a bit more size. Competed well in the ruck, with his size helping. Did look a touch slow on the lead when playing up forward and when he wasn’t rucking was always the deepest forward.